In the past days I’ve been working on a little plugin that will help especially new players find out about the minigames we have running on Skyblock. Check it in-game and let me know what you think. There’s a lot more that will be changed at spawn in the next few days. This entry was posted in Minecraft Skyblock Server News on May 25, 2014 by heatseeker0. Personally I don’t like it,I prefer the old spawn the on I went on to build… it just changed to much and it seems alien to me. 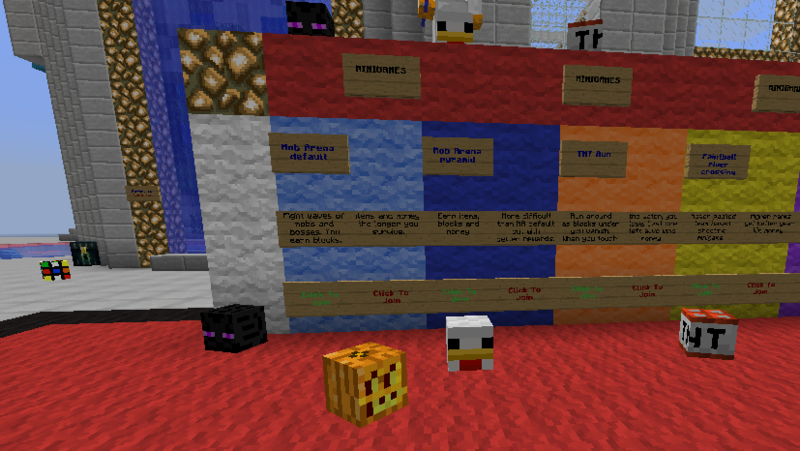 Yes it means new players will find the minigames more and there seems more players at spawn. Although what I don’t get is why you replaced the glowstone? It the double slabs that are producing the most lag as I have the same amount of glowstone on my warp the only difference being the base of double slabs being single to me. There will be more changes, this is just the beginning. You know it’s always 2 sides of the coin: some want new things, some prefer things stay the same. Unfortunately for your amazing spawn copy, this will be hard if not impossible to replicate. And the glowstone will be reduced to a bare minimum. It is glowstone that causes the most visual lag, it always was and I’ve helped a lot of players optimize their warps by having almost all removed from it. What about now Happy? I did many more changes and I’ve had other players say they get no visual lag anymore after these. Unfortunately, I can’t play right now. I’m using the 1.8 snapshot, and I would like to keep my slime blocks, so I’m not willing to downgrade my Minecraft right now. I’ll see you all when 1.8 is officially released! You know the Mojang launcher has all MC versions? Long are the days when you needed to downgrade, now you simply pick which version you wanna play from a list. The slime blocks stay until you open the world, silly.